Celebrate National Root Beer Float Day with me on Thursday, August 9 at The Irvine Spectrum Center. 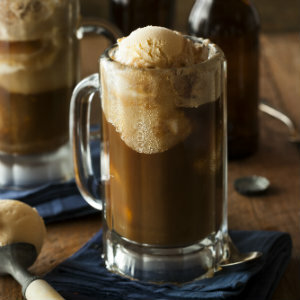 The Marriott Irvine Spectrum will be setting up a root beer float stand in front of the Edwards Theater from 11 a.m. to 3 p.m. and will be making root beer floats for those who stop by the booth and make a donation to Children's Hospital of Orange County. The root beer floats will be purely donation-based (people can donate any amount, and all proceeds will go directly to CHOC. I’ll be there with other influencers to create our root beer floats for a mini competition for a great cause. The influencer who wins will also have their root beer float creation featured on Heirloom Farmhouse Kitchen's menu (with a portion of the proceeds going to CHOC). Curious as to why National Root Beer Day means so much to the Marriott family? In 1927, just after J. Willard and Alice S. Marriott were married, they drove their Model T Ford across the country to open an A&W Root Beer stand in Washington, D.C. Beginning in Salt Lake City, Utah, the trip took 11 days over dirt roads. That first restaurant had nine stools. They grew this small A&W into a restaurant chain called the Hot Shoppe, which quickly became a mid-Atlantic sensation. Eventually, in 1957, they opened the first Marriott motor hotel in Arlington, Va. The tiny root beer stand has, today, become the largest hotel company in the world. Marriott must continue to embed its values and culture into this growing company.